Yes recreational boaters on average behave responsibly, but accidents do happen and nobody wants to see an oil spill gathering around their boat in the marina. Small Oil Spill Kits are being given out free to help boaters keep the water clean and to raise awareness of the need to be always vigilant. To help boaters prevent oil spills, Free Small Oil Spill Prevention Kits are being given out by the Washington Sea Grant Program, U. S. Coast Guard and the U. S. Coast Guard Auxiliary. The free Small Oil Spill Prevention Kits have a Bilge Sock to put in the bilge to soak up any oil or fuel spills that make it into the bilge. There are also gloves and a trash bag and information on how to avoid a fuel or oil spill and what to do if you have a spill or see one. How do you get a free Small Oil Spill Prevention Kit? This year the Washington Sea Grant Program has joined forces with the U.S. Coast Guard and U.S. Coast Guard Auxiliary to widen the distribution network. The Spill Prevention Kits will be available at some public events from the Auxiliary (the Neighborhood Night Out at the Shilshole Marina, August 4, 2015 is the next event). The Auxiliary will also be giving the kits out as part of their Vessel Safety Exam program as well as reaching out to boating groups the Auxiliary has been working with as well as new groups and venues. What to do in the case of a spill. Attempt to minimize the damage using containment booms or oil absorbing pads. Do not do anything that might start the spill on fire. The law requires you to call both the Coast Guard and your state response center. Failure to call can subject you to very large fines and penalties. Two other useful offices and organizations are also listed. Using detergents will break up the fuel or oil and let the spilled product sink into the water column where it can linger for many years and cause long term damage, especially in closed waters. You want the spill to remain on the surface where it can be cleaned up using traditional methods (sorbents, boom/skimmers, etc.). All applications of any chemical countermeasures require strict government permitting and is not used on recreational boat spills in closed waters.. 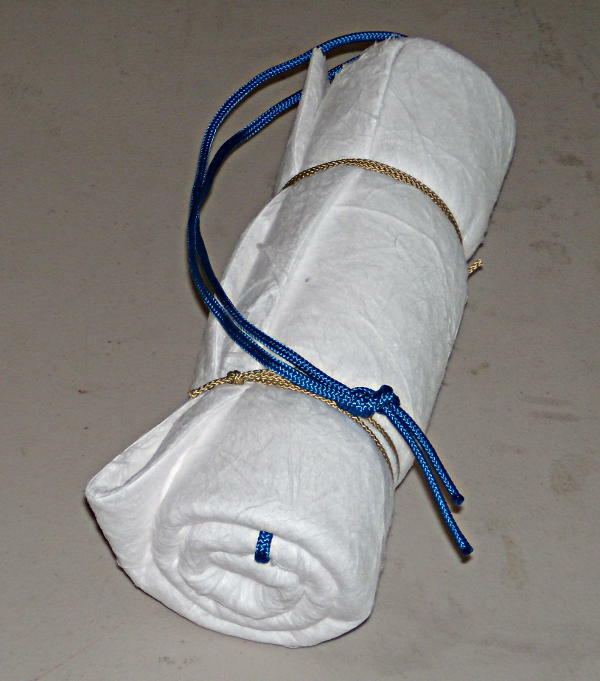 When fueling use an absorbent pad to catch any drips, this keeps drips off the water and your boat. Most fueling stations are now providing an absorbent pad for you to use, many places cut the pads into quarters since usually only a few drops of fuel will drip from the nozzle. Be sure to place the absorbent pad on the nozzle when you lower the nozzle to the fuel fill and when removing the nozzle from the fuel fill to catch any fuel drops. Also when fueling place a No Spill bottle over the fuel air vent. The No Spill bottle attaches with suction cups over the fuel air vent. Make sure the No Spill bottle is attached to the boat with a piece of small line, sometimes the suction cups fail and the bottle can fall into the water with any fuel in it and dump the fuel into the water. The Oil Spill Prevention Kits are being given out for free and are funded from the state of Washington with a small marine tax and administered by the Washington Sea Grant program. The start of the program goes back over 20 years when Eric Olsson was working with Harbormasters, the U.S. Coast Guard and Marina Operators in Puget Sound to improve spill prevention with the marinas and boaters. Eric got a call from the Blaine Marina Manager, seems a boater had the poor form to discharge some oily waste into the marina just before a Coast Guard patrol entered the marina and found the oil spill. The Coast Guard for some reason was not amused and actually somewhat irritated and they wanted to know what the marina was going to do to prevent future spills. Eric and the Marina Manager discussed various options and it soon became apparent that a few signs would not work and that a more aggressive and pro-active approach would be needed. 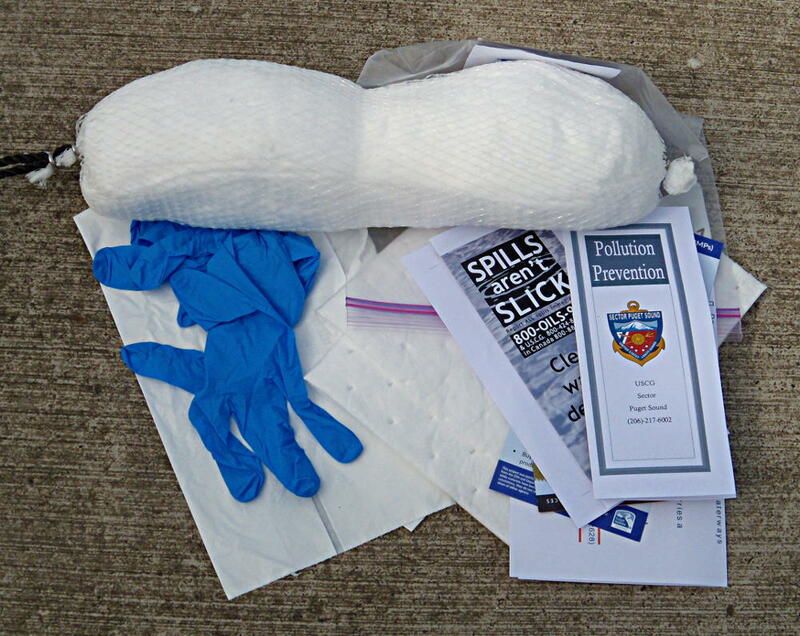 Eric put together a Spill Kit with a Bilge Sock, educational materials and other items. the kit was quite similar to the ones still being distributed today to boaters. Eric and the marina personnel hand delivered a kit to each boater in the marina and the Spill Kit program was off and running. Puget Soundkeepers are also giving out their own Spill Prevention Kits. They will be on the water giving the kits out during SeaFair. Caution when using a Bilge Sock or other absorbent material in the bilge. The Bilge Sock or other materials (pads etc.) need to be secured so they will not interfere with the bilge pump operation, some bilge pumps have external float switches and the Bilge Sock could jam the float and prevent the bilge pump from operating properly and turning on. Several mechanics I have talked with over the years recommend that you put Oil Absorbent Pads under your engine just in case something goes wrong, the pad is ready to catch the oil or fuel before it goes very far. The pads being white also make it easier to see a small drop of pollution or other issue such as rust or corrosion flaking off the engine. Can’t find a kit and want to make your own Bilge Sock? 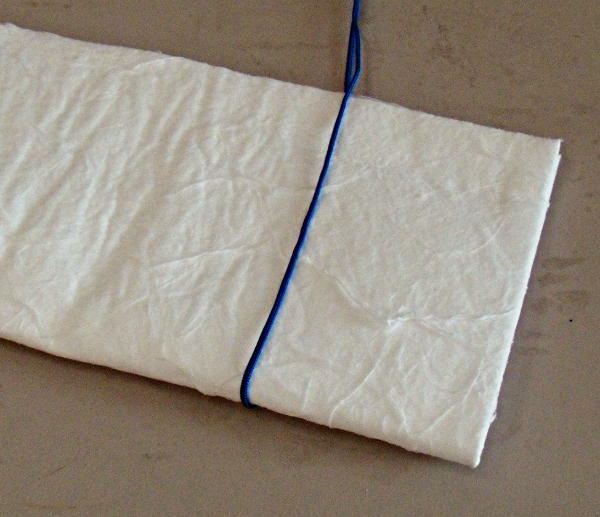 Take a standard Oil Absorbent Pad, fold it in half length ways, loop a short length of small line around the folded pad (see the picture), looping the line this way makes sure the pad will not fall off the line and get lost in the bilge if a knot slips. Then roll up the Oil Absorbent Pad and tie a couple of pieces of small stuff around the rolled up Oil Absorbent Pad and you now have your own custom Bilge Sock ready to stop pollution in it’s tracks. See below for Guides to help prevent oil spills, some of these are included in the Small Oil Spills Prevention Kit, they are included for those of you that don’t get a Spill Prevention Kit or do not live in Puget Sound or Washington State. I want to extend a special thanks to Aaron Barnett and Eric Olsson at the University of Washington Sea Grant Program, Andy Gregory of Puget Soundkeeper Alliance and LTJG Trevor Siperek, U.S. Coast Guard, Sector Puget Sound, Incident Management Division for helping with this article and giving permission to include the handouts and their work for making the Small Oil Spill Prevention Kits possible. This entry was posted in Boat Maintenance, Boating Safety and tagged boat equipment, oil spill cleanup, oil spill prevention, pollution prevention, safety equipment. Bookmark the permalink. A must have: fuel tank vent whistle. One of these installed low in a fuel tank vent line will significantly reduce chances of a spill when refueling, particularly for a crew who harried or distracted. When the whistle stops, the tank is full. These are good suggestions that should be followed not just by boat owners, but with other individuals who have problems in chemical spills, thank you for the guide in making bilge socks. Enter your email address to follow Captnmike and receive notifications of new posts by email. Coast Guard locates vessel with 49 people after passenger calls 911 reporting operator lost in heavy fog off Navy Pier. Contest – Depose the Bowline – My Entry Was The Winner! !